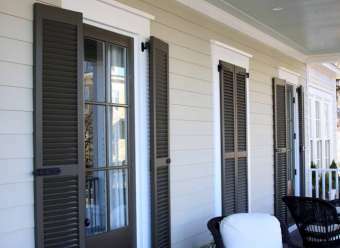 Top quality custom exterior shutters for distinctive homes. We are confident you will not find a better shutter than Southern Shutter Company builds. Choices are what you will get because there are three levels of quality custom exterior shutters to choose from. Every one of of the levels gets you mortise and tenon joints so you can be assured that your custom exterior shutters will last. The "Standard" level will be the low price and lighter duty choice. The "Heavy Duty" level gets you exactly what the name implies plus more choices, details and sizes to choose from including dropped rails and beaded side stiles. The top of the line "Designline" level gets you unmatched choices and custom options and styles along with different louver choices like the traditional louver or a European louver style. For information & pricing, choose an exterior cedar shutter category below! Our Premium Western Red Cedar exterior wood shutters feature time-proven MORTISE and TENON JOINERY - no interior dowels and screws like many use now days. Each of these Cedar exterior movable louvered shutter lines can be crossed with their sister mortise & tenon Cedar paneled shutter to create custom variations of combination exterior cedar shutters. Exterior cedar shutters have a timeless appeal. Time adds characteristics to wood shutters that can not be simulated by synthetic products. As a wood shutter ages, the elements wear, the paint layers build. Each shutter takes on a personality of its own, giving a home unique character that plastic can only imitate. Every seven to ten years you will need to refinish an exterior wood shutter. Simply lift your functional shutters off their pintles and repaint. Refinishing the custom exterior shutters enables one to change colors, or not. Built to last, these mortise and tenon exterior cedar shutters will provide a lifetime of service and are protected by a limited lifetime warranty. We recommend Western Red Cedar for Exterior shutter Products, naturally decay resistant and light weight, it is the perfect choice for outdoor window shutters. Harvested from Canadian forests Western Red Cedar is FSC certified sustainable. Although we offer a variety of species, Western Red Cedar has been our preferred material since 1964.